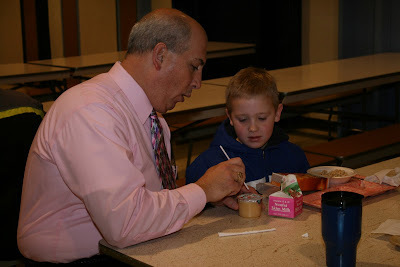 Superintendent Paul Sheffield shows first grader Casey Underwood exactly how to make the straw work with his cup of juice. The salad bars holds a few breakfast extras. Peanut Butter and Jelly is available along with butter and cinnamon and sugar for toast (the toaster is in the service area where it can be supervised). 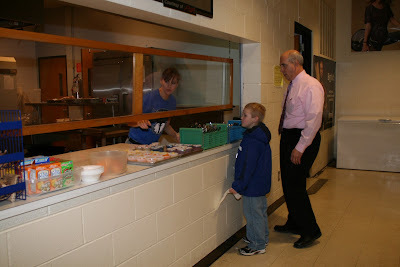 Lori Ruhl, left, serves breakfast to first grader Casey Underwood while Superintendent Paul Sheffield helps Casey navigate breakfast for the first time. 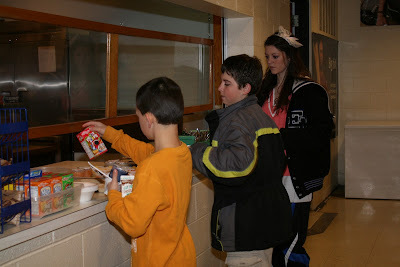 Second grader Jackson Beethe,left, Freshman Devin Sheffield and Senior Amanda Dinneen make their breakfast choices at the Exeter site of the Exeter-Milligan School District. It may not be Breakfast at Tiffany's but what sounds better, a buffet of hot and cold breakfast foods for $1.25 or whatever you can grab as you leave the house? Students at Exeter-Milligan can now take advantage of the opportunity to eat breakfast at school. 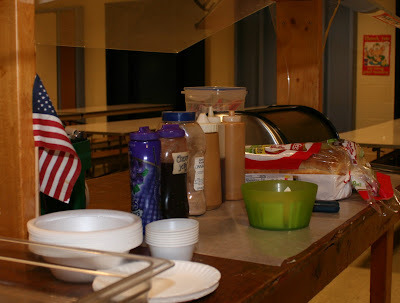 Due to the weather delays both campuses of the Exeter-Milligan school district served their first breakfast on Wednesday, January 12th. The idea of serving breakfast was brought to the district by Exeter-Milligan Superintendent Paul Sheffield. “At my previous position I was instrumental in starting a breakfast program and it went over pretty well. It took some time to build it up and work out the kinks, but it is something that benefit’s the students. I brought up the idea with teachers and they were on board. The extra push to get it going came from my son - he asked me when we would start having breakfast at the school,” said Sheffield. Having two different sites for the program made planning a little more challenging, but the staff was up for the task. The most difficult part of the program has been planning how many students to be ready to serve at each location since some students arrive at the Exeter site for transportation to Milligan. Often making the window of opportunity for them to eat very small. To help plan for the number of students eating breakfast, teachers ask their classes during lunch count in the morning if they will being having breakfast the following morning. Included in that question is the location they plan to eat at. So far it has worked well to follow the count this way. The faculty and staff at Exeter-Milligan have several goals for the program. They see the program as an attraction to students who run late along with the nutritional factors. “With our low cost and nutritious offerings we hope to attract students to this kind of meal as opposed to donuts, chips and pop which we see a lot of. Studies have shown the kids do better in school both academically and socially fueled with breakfast in their stomachs,” said Sheffield. As far as the additional costs for the program staffing was already in place at both locations. “Really since the staff was already there in the morning it was just the cost of the food. We plan for the program being self-funding,” Sheffield explained. Of course the school is reimbursed by the State for each student who eats a meal free, at a reduced cost or at full price. And according to Sheffield, the students who have eaten breakfast have been from all categories of lunch costs so it is serving a need for entire student body. 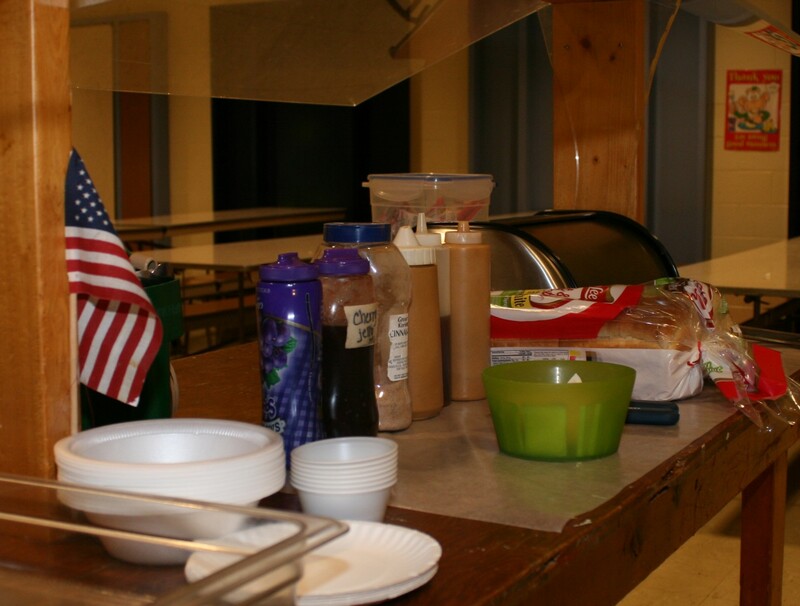 So far at both sites they have been serving 25- 30 breakfasts each morning. At his previous position Sheffield always saw the number almost double when biscuits and gravy was on the menu so he is curious to see how that offering is accepted at Exeter-Milligan. Some students who ride the bus from the country and then stay on the bus for a ride to their campus might not have free time to take advantage of the program, but faculty are recognizing the difference breakfast can make in school performance. “We won’t deny breakfast to a student, the meal is more important that being on time for class. Of course we have to watch that kids won’t milk the situation, but the response from students has been positive,” according to Sheffield.